After missing out on the 2017 AFL Draft, Quentin Montanaro is hoping that the North Melbourne VFL team can be his route into the big time. 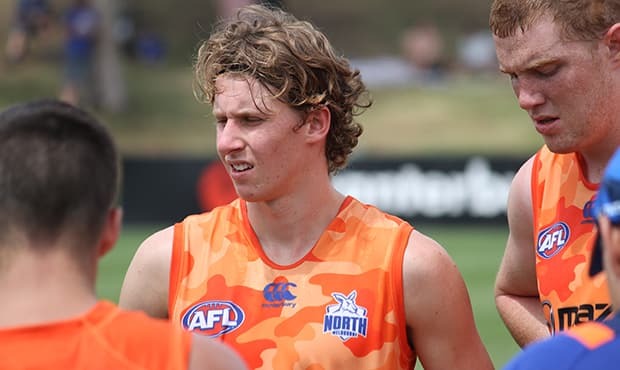 Recruited from the Sandringham Dragons TAC Cup team, Montanaro said the opportunity to join a VFL program like the North’s was too good an opportunity to turn down. “Coming from the Sandringham Dragons, I got offered a spot here at North and thought what better place to develop my footy,” he told North Media. Being involved with the AFL boys has been a welcome shock for Montanaro, and this was evident when the VFL list took on the AFL list in an intra-club match simulation in January. “Coming out of under-18’s, I’ve never really had a crack at senior footy, so it was pretty different,” he said. As well as the club’s AFL affiliated program, Montanaro is looking forward to working with the newly appointed VFL leadership group. “It’s awesome to have such a strong leadership group, especially for a young guy like myself,” he said. Within the leadership group, Montanaro is looking up to a couple of players in particular. “CJ (Chris Jansen) and Harps (Jordan Harper) have come across and played footy at really high levels, and from what I’ve seen they are looking really good,” he sad. And as to what North fans can expect from Montanaro in the VFL. “I’m mainly a running player, and mainly an outside player. I base my game around my skills and my ability to find the footy on the outside,” he added.